AllegroMedical.com presents The Attends Dri-Sorb Standard Use Underpads offered from Attends Healthcare Products. 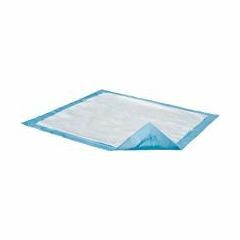 Attends Standard Use Underpads are available in a variety of sizes and absorbencies and are perfect for standard, everyday use in hospitals, long-term care facilities and in the home. They are great for protecting mattresses and chairs but also promote healthy skin by having a soft, cloth-like topsheet that covers the entire surface while the top layers wick fluid away from the skin. Inner, cellulose fibers make them comfortable and absorbent, and a strong, leakproof backsheet holds fluid.